Lethal Tender plays very similar to Wolfenstein 3D and FPS in general. Shoot guards, collect colored keys to open doors, pick up more powerful weapons—you know the drill. 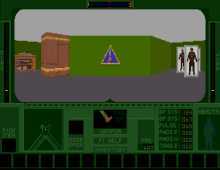 The game does set itself apart from other shareware FPS with the addition of inventory screen, some inventive level design, and some semblance of plot development that is a step above Wolf 3D (a small step, though). Probably one of the better shareware FPS games out there, although lacking the polish to rival commercial games. If you are a diehard FPS fan who can stand below-average graphics and banal enemies, give this one a try. For a much better effort, play the semi-sequel Terminal Terror instead.